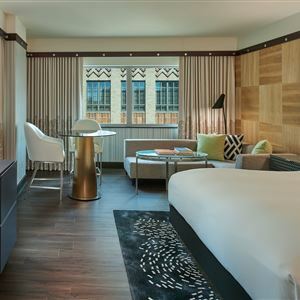 Property Location With a stay at Sofitel Philadelphia, you'll be centrally located in Philadelphia, steps from Liberty Place and Art Institute of Philadelphia. This 4. 5-star hotel is close to Liberty Bell Center and Independence Hall. Rooms Make yourself at home in one of the 306 air-conditioned rooms featuring minibars and flat-screen televisions. Complimentary wireless Internet access is available to keep you connected. Private bathrooms with separate bathtubs and showers feature designer toiletries and hair dryers. Conveniences include safes and complimentary newspapers, and housekeeping is provided daily. Amenities Take advantage of recreation opportunities such as a 24-hour fitness center, or other amenities including complimentary wireless Internet access and concierge services. Additional amenities at this hotel include babysitting/childcare (surcharge) and wedding services. Dining Grab a bite at one of the hotel's 2 restaurants, or stay in and take advantage of room service (during limited hours). Quench your thirst with your favorite drink at a bar/lounge. Business, Other Amenities Featured amenities include wired Internet access (surcharge), a 24-hour business center, and limo/town car service. Planning an event in Philadelphia? This hotel has 16870 square feet (1567 square meters) of space consisting of a conference center and meeting rooms. With a stay at Sofitel Philadelphia, you'll be centrally located in Philadelphia, steps from Liberty Place and Art Institute of Philadelphia. This 4. 5-star hotel is close to Liberty Bell Center and Independence Hall. Make yourself at home in one of the 306 air-conditioned rooms featuring minibars and flat-screen televisions. Complimentary wireless Internet access is available to keep you connected. Private bathrooms with separate bathtubs and showers feature designer toiletries and hair dryers. Conveniences include safes and complimentary newspapers, and housekeeping is provided daily. Take advantage of recreation opportunities such as a 24-hour fitness center, or other amenities including complimentary wireless Internet access and concierge services. Additional amenities at this hotel include babysitting/childcare (surcharge) and wedding services. Featured amenities include wired Internet access (surcharge), a 24-hour business center, and limo/town car service. Planning an event in Philadelphia? This hotel has 16870 square feet (1567 square meters) of space consisting of a conference center and meeting rooms.